My jewelry is created using pieces from my various jaunts to local thrift stores, estate sales, flea markets and some pieces from my personal collection. I am in love with this piece. It started out as a vintage brass four-picture locket. To the top, I added a vintage glass crackle opal cabochon . The color of this cabochon is amazing. It is an icy white with white variations inside. This locket opens to hold four photos with tape or glue. 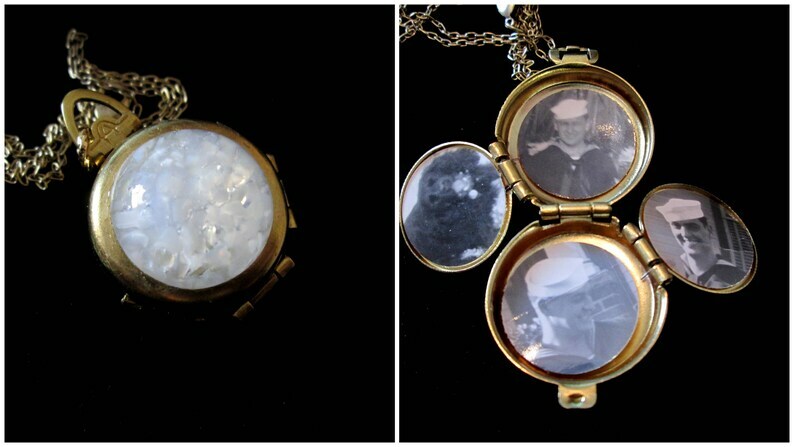 Please note, the photos in the locket are for display purposes only and may not be included with your order. This locket is hanging on a brass chain along with a brass lobster closure. Please note that as this piece is vintage, it does show signs of age. This chain measures approximately 18 inches but can easily be adjusted upon request at check-out. The locket is approximately 1 inch in diameter. The photo portion of this piece is 3/4 inch in diameter. I ordered this to hold my mother's photo at my ceremony. I will be pinning it on my bouquet. Was happy to find one in brushed gold - I didn't want it to be too shiny. Thank you for super fast delivery of very nice piece! I currently accept Paypal and credit cards through Etsy as payment. You can also pay via a credit card through Paypal, if you need any assistance with this, please contact me. I am willing to consider other forms of payment on a case by case basis. If you wish to pay via another method, please contact me. Payment is expected at the time of the purchase. If you pay with an echeck via Paypal, your item will be shipped once payment has cleared. I will contact you to let you know that I have received payment and that your item is shipping. Your happiness is my ultimate goal. If you are unhappy with your purchase for any reason or at ANY time after your purchase, please contact me. All returns must be made within 1 week of your receipt of the item, and in the original condition to receive a full refund less shipping and less a 3.5% restocking fee. All returns thereafter will be decided on a case-by-case basis. Please contact me with any questions. I currently ship via USPS First Class mail with delivery confirmation (domestically-this does NOT require a signature). For most domestic packages over $100, I add complimentary shipping insurance. I now also offer the option to upgrade your domestic shipping to Priority Mail (2-3 day) and Overnight Mail. I ship First Class Mail International for all overseas packages. You are responsible for all taxes/duty for packages entering your country. Your purchase will be wrapped in tissue paper and an organza bag. If this is a gift, please let me know if you want me to add a personalized note. I ship all parcels in padded mailers or crush-proof boxes.